TEMS Investigation 16.3 extends its on-device testing repertoire with the FTP, HTTP, and Ping services, all available on the Sony Xperia Z2 D6503. The benefits of this are manifold. For one thing, an on-device client is sure to get the same QoS as a real-life user, thus capturing the true subscriber experience with greater confidence than a PC-based client. On-device testing also offloads the PC by relieving it of processing tasks that are instead handled by the devices. Mode reports are obtained from Qualcomm chipset LTE devices when secondary serving cells are activated and deactivated in an LTE network with carrier aggregation. The mode reports extract these vital facts from logs which generate huge volumes of data and are therefore unattractive to decode. Multimedia Broadcast Multicast Services (MBMS) is a standard designed to provide efficient delivery of broadcast and multicast services. When offered over LTE, it is referred to as eMBMS. 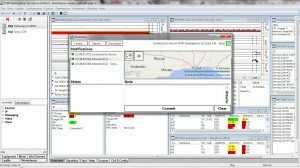 Target applications include mobile TV and radio broadcasting as well as file delivery and emergency alerts. Do you need to structure your drive testing? RouteDiary is a stand-alone utility that lets you take notes on drive tests in a structured manner and link them to logfile data. 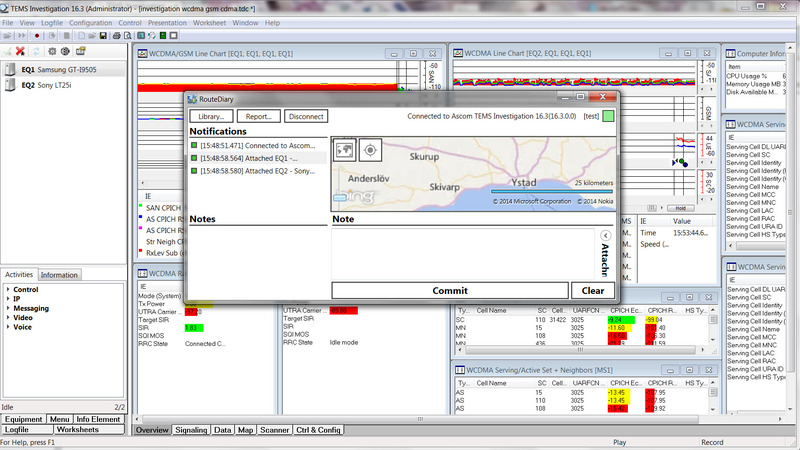 RouteDiary can be launched from within TEMS Investigation and run concurrently with it during testing. The utility is equipped with its own map view where your drive test route is traced. Reports can be generated in RouteDiary based on your entered notes, also including a summary of TEMS Investigation activities similar to that found in the Navigator pane. LTE MIMO scanning with multiple Rx antennas, already available with the PCTel SeeGull MX scanner, is now supported also with the newer IBflex model. TEMS Investigation 16.3 adds support for spectrum scans with the R&S TSMW scanner on multiple technologies: LTE, WCDMA and GSM. The regular user interface of an Android phone can be accessed and interacted with through a new view in TEMS Investigation called Android Phone Monitor (opened from the context menu of a connected device in the Navigator). Tapping and swiping can be directly imitated with the mouse, whereas additional controls are provided corresponding to the device’s physical buttons. The monitor is useful especially for controlling a device in a remote location. IPsec is a protocol suite for authentication and encryption of IP packets. When IPsec is in use, it blocks SIP and RTP messages, which are crucial to both scripted data collection and presentation in TEMS Investigation, as well as to user actions during drive testing. If you are interested in Ordering it, or any other TEMS product please fill form below and send your request.